The trip started in downtown Madras, wound under the trestle up to Agency plains with a quick stop at the Beamer’s before taking the Old Campbell Road to Pelton Dam, continued further to the ferry crossing near Warm Springs and then back to Madras. Notice how street names, distances or directions are slim pickings? That’s how it’s done out here. Having grown up in Madras I knew some of the people on the trip; our driver was John Campbell, who went to high school a few years ahead of me, and his dad, John Campbell (these are the same Campbells that the Old Campbell Road is named after). John (Sr) also had a twin, Dave Campbell, who drove another Model T that later beat us in a road race due to 10 extra horse power. 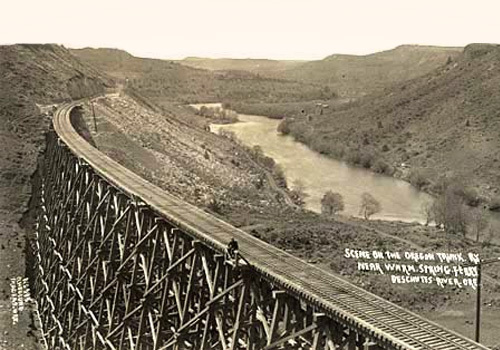 Man sitting on the rails on the Oregon Trunk Railway running beside the Deschutes River, 1915. From the Oregon State Archives. All in all there were twelve Model T’s and Model A’s in our caravan, and everywhere we drove people waved and clapped. I practiced my parade wave while the toots and honks of ancient car horns were heard all through Madras. Some of the cars were parade worthy with shiny paint jobs and fancy spokes, while others were in-progress workhorses that wore their age with pride (except when our T blew a spark plug going up a hill and we had to disperse into other vehicles so it could summit without actual horses pulling it). Towards the end of the trip we stopped at the Ramsey’s house for a picnic of BBQ chicken, baked beans, potato salad, biscuits, strawberries and FIVE kinds of cookies. I tried three kinds and they were all delicious. Their house was one of the original homesteads in Madras (1914), and while it had been renovated to meet the demands of the 21st century lifestyle, it still had plenty of charm. I saw plenty of new scenery, made a few new friends, and went home with a full belly…which to me constitutes a darn good birthday outing. Looks awesome, jeg er en lille smule misundelig på tur! Great pictures what camera did you get? Ja, Oregon har nogle gode udsigter, right? I got a Canon S90. It’s great – I just point it at things and push the button! It even has zoooooom! Your dad told me about the blog, so we’ve checked it out, and have enjoyed the fine photos and your droll narrative very much. Happy Birthday! From the evidence here, it must be a fine new camera, but obviously you know how to compose and shoot! We’re delighted the two of you, and your mom and dad, were able to come along for the Tour. You won’t be surprised when I say that your dad is a mainstay of the Historical Society, a kindred spirit and co-conspirator. Some time when we take Steve and Lisbet to our summer range place 25 miles east of here, maybe you two can come along.